Cleveland State University this year has produced the second most Fulbright scholars in the nation. That second-place ranking was shared among five universities, which all produced six Fulbright scholars for the 2010-2011 academic year. Tying with CSU in second place were George Washington University, University of Florida, University of North Carolina at Chapel Hill and Washington University in St. Louis. Tied in third place with five Fulbrights were Harvard University and Stanford University. Leading the nation this year was The University of Illinois at Urbana-Champaign, which produced eight Fulbright scholars. For years, CSU has been among the nation’s leaders to receive Fulbright grants with more than 40 in the past decade. This year, CSU Fulbright scholars will to travel to Turkey, Finland, Taiwan, Kenya and Costa Rica, where they will lecture, conduct research and build relationships with foreign universities. This year’s CSU Fulbright scholars include Maria Angelova, Joshua Bagaka’s and Mike Loovis from the College of Education and Human Services; Mike Lin and Victor Matos from the College of Business; and Robert Wei from the College of Sciences and Health Professions. The Fulbright Program is the flagship international educational exchange program sponsored by the United States government. It is designed to increase mutual understanding among the people of the United States and those other countries. The Fulbright Program provides participants-chosen for their academic merit and leadership potential – with the opportunity to study, teach and conduct research, exchange ideas and contribute to finding solutions to shared international concerns. Books … how much longer will the last? A story posted on Ohio.com/Akron Beacon Journal on 12 October 2010 makes note of a new library policy to only keep 2 of each text book housed in the library – which means hundreds of books are being destroyed. The reason sited is that there is no money to build additional housing for books and that online versions are available (which cost nothing to store). Is this the middle of the end of the printed book? Below you’ll find the article. COLUMBUS: Ohio is thinning out its collections of spillover books from 13 university libraries because warehouses are running out of room. The state has five book depositories and doesn’t have the funds to build more. So librarians say their goal is to leave just two physical copies statewide of lesser-used academic books and journals. A consortium that includes Ohio’s university libraries and the State Library of Ohio says hundreds of reference materials have already been donated or recycled. Ohio State University history professor Kevin Boyle calls the policy catastrophic. He tells The Columbus Dispatch books are being lost for good. The OhioLINK consortium maintains there’s less need for printed copies of works because electronic versions are available. Congratulations to Ken Lanci for entering the Cuyahoga County Executive race. Lanci is running as an independent, and with his successful business track record and passion for this region, he is absolutely the right person to turn this county around. Lanci is committed to working for just $1 a year, donating the rest of his salary back to the county. And since it is campaign finances that has corrupted the county in the first place, he will not accept contributions from county employees, or more than $250 from individual donors. Lanci is a refreshing candidate and has our support on Election Day. Learn more about him at www.kenlanci.com. And follow him on Facebook, Twitter and LinkedIn. The Downtown Location continues to host Acousitc Night in our PUB every Thursday night, starting around 8 or 9pm. The venue is free of charge and there is no purchase necessary to see a performance. “Damn Fine Blues!” Original & classic delta blues featuring slide guitar and baritone vocals. A blues gumbo repertoire that blends in jazz, folk, soul & rock ‘n’ roll. 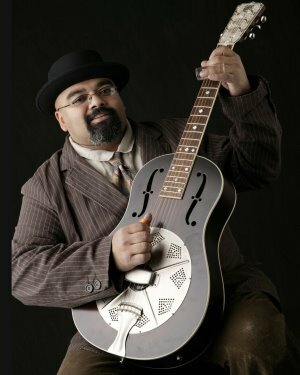 Austin “Walkin’ Cane” Charanghat is a blues singer, songwriter and slide guitarist that performs acoustic solo, duo & electric band sets. Walkin’ Cane has travelled all over the country from New Orleans, Louisiana to Juneau, Alaska and has acquired various blues/instrumentalist awards over the years. Austin walked for ten years with a cane due to an arterial venous malformation at birth. While performing on Bourbon Street in New Orleans, a homeless man called out “Hey Walkin’ Cane got some spare change for a brother? !” Charanghat took the jibe as his nickname. In 1996, after years of battling the inevitable, his left leg was amputated below the knee. A year after the surgery, he returned to the music scene stronger & without need of a cane. In 2002, Austin & Karen Starks were married at Sun Studios in Memphis, Tennessee and began recording his 706 Union Ave. cd at the legendary studio immediately after the ceremony. “The thought of recording & getting married in the same room where many of my heroes took their first steps was incredible.” Austin “Walkin’ Cane” is proud to be sponsored by National Reso-Phonic Guitars, Dr. Z Amplifiers & Ernie Ball Strings. “Walkin’ Cane’s” latest cd, “Murder of a Blues Singer”, was inspired by an after hour diner conversation with blues legend Robert Jr. Lockwood. “The stories were flowing like the grease off our plates”, subsequently the album is saturated in classic delta blues, as were the tales of Lockwood’s stepfather, Robert Johnson. Mr. Lockwood had agreed to perform on the record, but fate had changed that path. The Walkin’ Cane Band featuring Mike Barrick on bass, Michael Bay on guitar & Jim Wall on drums captured the perfect “live in the studio” feeling that Charanghat & co-writer Chris Allen had envisioned for these songs. The band is a “well oiled machine” & has been writing, recording & performing together since 1998. Special guests on “Murder of a Blues Singer” include Colin Dussault (Colin Dussault’s Blues Project), Eric “Eroc” Sosinski (Michael Stanley, Wish You Were Here) and one of Cleveland’s finest gospel groups, the Prayer Warriors. 2006 – National Reso-phonic Guitar CD Compilation “Love Grown Strong” – Walkin’ Cane original included. Brent Kirby is a night’s stroll with a rock n’ roll romantic. This does not mean Kirby’s merely a smitten troubadour, or a bard for the wayward but colorful life of musicians. Though his own songs bring up those immortal topics, Kirby’s romanticism is much bigger than that. His songs start with the introspective stir of strum and voice, but not unlike his performances, gradually move outward, embrace the listener. There might be a melancholy shade to some of Kirby’s songs, but ultimately, they’re colored by faith, hope, and love. Those qualities are all in abundance on his solo record, Last Song On The Soundtrack. Last Song On The Soundtrack starts out with the laid back country-rock of “Silently Stepping Out”. Kirby, having lived in places as varied as Chicago, Nashville, St. Louis, Milwaukee and Cleveland, has acquired a keen narrator’s eye. This optimistic ode might detail loneliness, but drummer JJ Juliano’s buoyant beat turns “Silently Stepping Out” into an anthem. Brent’s tells a honky-tonk tale of gigs upon gigs in “Dream The Night Away”, not as nightly grinds but as places where dreams really come to life in gritty color. “Lonesome Holiday” pays homage to Springsteen not merely in its arrangement, but also in its lyrical longing. Kirby’s “Truth Tonight” brings to mind “People Get Ready” and “Tupelo Honey” while adding the insistence of an uncertain lover. “Holding That’s Hard” showcases a bit of the rock he’s known for in the band he fronts, the Jack Fords; Al Moss’s distorted pedal steel sweeps through this jam like a long-lost Pink Floyd tune. This slow burner done, Kirby ends Last Song On The Soundtrack with the simply pretty “All I’ve Ever Wanted”. Tales are told, wishes are made, and when all’s said and done, “All I’ve Ever Wanted” lists the bounties of the soul. Not gold, not a “big ol’ chrome car to drive”, not fame, but the simple pleasure of deep and abiding companionship. A similar emotion propels Kirby in a live setting as well. Solo, or with a band, he puts forth a heartfelt sincerity that’s been honed by countless gigs and a sheer desire for perfection. The following is an excerpt taken from the website of recent Acoustic Night performer, ZACH. Zach is no stranger to touring. He performs over 200 shows a year, taking him all over the country, and placing him on stage with Chicago, Bad Company, Catie Curtis, Maia Sharp, Steve Poltz, Rick Springfield, Rusted Root, Farm Aid, Jen Chapin, Michael Bolton, and Buckwheat Zydeco. His exciting, high energy shows and spiritually emotional material have gathered a devoted following and give Zach the ability to win-over and move audiences both in and outside of his genre. “People want to be entertained, but you can’t always be mindlessly entertained. That only goes so far and only fulfills so much. You need substance too.” The coffee shop scene permitted Zach the opportunity to begin and grow as a performer, and he still gravitates toward the more intimate settings. “I love to rock out and dance around! Anytime. But songwriter shows, especially the New York Songwriter Circle at the Bitter End, are so fundamentally based on the song and not the show and are mentally very gratifying. It is so inspiring to be on such a legendary stage with peers on both sides of your career, learning from them. You never stop learning. It’s one of my favourite aspects of life.” Zach is being dubbed a role model for the echo-boomer generation, though he is very appealing to all age groups. His fan-focused approach to performing and promoting, which includes the widely popular “Zach Pack Newsletter,” has earned him a growing and dedicated fan base, resulting in, among other things, his website, Zachmusic.net receiving around 30,000 hits each month. Zach’s heavy performance schedule has also awarded such accolades as #3 All-Time Best Artist as nominated by the 20,000 listeners of WAPS 91.3 FM The Summit in Akron , Ohio and a Finalist in the Soul City Café Music Quest sponsored by pop-star Jewel. “’You must be the change you wish to see in the world’”. Best Singer/Songwriter, a 3 time winner of Best Pop Act in the Cleveland Music Festival, 2 Golden Viking Awards, Best Singer/Songwriter Nominee in the Free Times Music Awards 5 times, Best Pop Song (Garageband.com); over 2,500 Spins on WAPS 91.3 The Summit; was a finalist in the national Soul City Café Music Quest; a finalist in the Unisong Song Contest; receives over 150,000 hits and growing per month on the website, and over 83,000 views on his MySpace; named in the TOP 3 Artists spun on WAPS 91.3 The Summit Radio (6 places above the Beatles); performs over 200 shows a year nation-wide, had his song “On Christmas Morning” spun on over 130 radio stations; wrote the jingle/theme song for the nationally syndicated radio show “Into the ‘70’s with Tom Kent;” had music featured in several independent films and an Extreme Home Makeover Documentary. *Letters to a Young Poet by Rainer Maria Rilke – the most inspirational thing I have ever read. Every word was written to me for me. Kevin Spacey referred this book to me, and I am more focused and defined in my music, art, and vision because of it. * Alice in Wonderland by Lewis Carroll – the first book I ever read over and over and over again. It single-handedly began my interest in words and word play. The more times I read it, the more inspired I get. *White Nights (Memoir of a Dreamer)/ the Brothers Karamozov by Dostoevsky – The most beautiful words I have ever read. A lot of my writing is a description, or emotion, or description of emotion. I wish I could someday do it all well as it is done here. *Appendicitis – I nearly died from a ruptured appendix, and the recouping time dashed my hopes of making the high school basketball team. During the time I was in the hospital, I had gotten a gift of a Beatles cassette and the Best of Queen CD. By the time I came out of the hospital, I had wanted to learn to play guitar and had already begun writing songs. *Jewel – I fell in love with her debut album, and saw her at an intimate venue outside of Cleveland , Ohio . The show was so moving to me, and she communicated her music and personality so well to the audience, it felt like the show was a personal one just for me. When I left, I knew I needed to be performing and seriously making music for the rest of my life. *High School Talent Show – I knew I was onto something good, when I had the sell-out 1,000 seat venue screaming and singing along with my own song. Then a huge fight and riot erupted. The police came. And I continued singing. The power of music! 11. My Fiction Writings: I’ve always been drawn to writing. My short story, Bolero: won 6th place in the 2001 New Century Writer Awards, was entered into a competition with Zoetrope Magazine and Francis Ford Coppola where it was a finalist, and was read at the National Undergraduate Literature Conference in Utah for the same year. I have also finished two novels. 12. Radio Writings: I wrote the jingle/theme song “Into the ‘70’s” for a syndicated oldies radio show created in Cleveland , Ohio that is currently on over 150 stations and counting! It has been my first adventure into writing music for platforms other than pop music. And it has been hugely successful. 13. Pets: I have an adopted Humpback Whale named Patches that lives in the Atlantic Ocean , and a little black cat named Zero. 15. Why “Face With a View?” We are always looking at beautiful things. To realize this is to truly feel. The music follows this whole theme. You should listen to the disc in its entirety. The answer is there, waiting. The answer is always the easy part. Rascal House has long supported Cleveland State, and has recently established the Irene Frangos Endowed Scholarship Fund. We want to congratulate the 2010 recipient of this scholarship, Micholas Yurko. Nicholas is entering his senior year as a Chemistry and Biology major at CSU and carries a 3.59 GPA. He plans to complete a medical degree in combination with a PhD in pharmacology. He is interested in working on cures for various diseases, including cancer. I must admit, after living in New York City for many years, the site of a celebrity got pretty normal. I’ve seen every from Beck to Lou Reed to Billy Crystal to Luis from Sesame Street out and about at the supermarket, in the park, or just walking down Avenue A. I even had the great fortune to deliver a Mauviel Copper Pot set straight up to the assistant of Princess Diana of Wales in her room atop the Park Plaza bordering Central Park. I’ve been void of the celeb factor for several years now, hunkering down here in Akron, Ohio raising a family and doing things “right”. Coming from a punk-like background, having toured the country with so-so bands who play hard and “play” even harder , I have a “thing” for thing for that kinda scene – I miss that kind of life sometimes, and my imagination loves to put me back in the middle of it when I let it wander. In the morning, every morning, after my dear husband goes off to work, I pack up the 5 year old and the 3 year old and we drive in the ol’ MV (that’s minivan to those who aren’t cool enough to know) to the local elementary school to resume his career as a second grader. On the way, we see people in their cars, on the first leg of their morning commute, housewives dropping off kids, kids waiting for busses or sometimes, if we’re lucky, we see the early morning runners. One such runner regularly catches my eye as he doesn’t appear to be the typical suited up, wearing $125 sneakers and a gym suit runner, he’s wearing cut offs, Converse low-tops and a sweat stained shirt that is clearly on its way out. Whoooaaaa … almost ran through that red light! The Natural History Museum is great – the neighborhood is gorgeous! I am pretty sure it is free admission or donation only. There is a little Children’s Museum very close to Rainbow. It is teeny in comparison to COSI – but it has some fun things … also it doesn’t take long. After 2 or 3 hours the girls will be done. The Great Lakes Science Center is a COSI type thing – not too far from Rainbow. If you have a COSI membership, they are reciprocal. There is a “Polymer House of Fun” or something like that that is just like a huge indoor playground… lots of fun for the younger set … even my 8 year old loves it though! Parking can be rough, but on a weekday I think it will be fine. There is a deck and I think it is $6 or something during the day. If they decide to go to the Science Center, they can walk along the water and over to the lobby of the Rock N Roll Hall of Fame. There isn’t much that kids would love and is is UBER expensive – but the lobby is small enough to be a kind of neat attraction with guitars and a motorcycle and stuff. If it is a nice day the walk is beautiful. If anything, the Rock Museum is a really neatly shaped building and the kids are always in awe of it. There is also a wind turbine out there that is cool to look at and talk about and stuff.